Whether you are searching for support whilst studying at school, college, university or in your professional career, LAP can give you the high end, bespoke support you are looking for. We have a range of specialist staff who can meet your needs for either short term or long terms support. For the long term ambitious students, we can help you prepare to raise your grades through your school studies. We can also help students, such as degree students, from time to time throughout your study programmes, to support you through difficult assignments or to simply help you raise your grade. Likewise, we can give you quality 1-1 Tutorial support to build up your confidence too. You may find that you are overwhelmed or concerned about the large group size on your foundation or degree courses and need some bespoke 1-1 quality time. We offer young people high end 1-1 support through the whole UCAS application process and portfolio preparation! My personal experience at LAP was life changing! Julia Dennis’ ability to connect with students and her talent at teaching are both truly superior. She has a great capacity to engage with the students and stretch their imagination by exploring unique art techniques. Her excellent written and verbal communication skills helped me not only to gain an individual point of view and express myself, but also were the key to understand not only what my designs were about, but what I am all about as an individual. 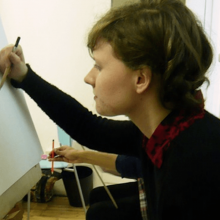 I had outstanding individual tuition and the skills I was directed to at my 1 to 1s not only helped me to gain confidence with my illustrations, but also motivated me to a great extent to push myself further. (I would have never thought about exhibiting my fashion illustrations if it weren’t for the confidence and skills I gained at LAP). Julia gives true motivation and inspiration not only as a teacher but also as an artist. 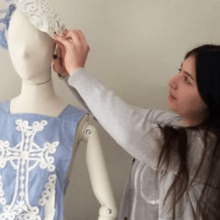 She has helped me to organise my work, develop my skills, believe in my ideas, and gain an identity and a differentiation in the competitive world of fashion and art. Thanks to her encouraging help and knowledge, I can proudly say I have not only found what I like to do most, but I have also found myself. “I’m currently an undergraduate student studying Architecture. 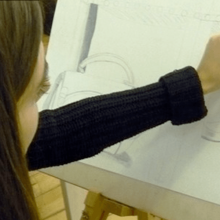 After failing my first year I began to attend one-to-one tutorials at London Art Portfolio. After attending tutorials for a year I ended happily with a first and now moving onto second year! Julia was of great help in finding an ideal tutor for me and organising the tutorials. She also recommended me to have the two hour tutorials which has benefited me greatly. 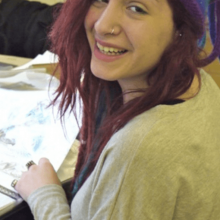 Julia also made sure that my portfolio was seen beforehand, so the tutor knew exactly what I had to improve on and to have an understanding of what the Architectural course’s style was like at my university. After every tutorial, I would have a structured list of what I had to complete for my portfolio. This helped me a lot, so I knew exactly what I had to do. In the tutorials I learnt new skills and techniques which generally wouldn’t be taught at university.